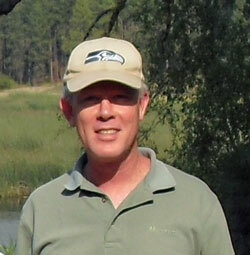 Hi, I'm Clark Hamilton, and I've grown tomatoes for many years, and in many U.S. states. I used to be in the military, so have lived and gardened in Texas, Ohio, Oklahoma, Utah, and now Washington since 1995. For the record, Ohio wins as the best of the lot for gardening. My regular job is computer programming. What got me started on this tomato focus was actually an affront to my male ego laid down by my beautiful bride of 30 years when she asked me why my own garden wasn't producing as many tomatoes as a friend's? Talk about laying down a challenge! After that, I began a quest to learn as much as I could about growing tomatoes. It occurred to me that I could share all this information I was picking up on a web site, as web development is another hobby. Not only that, but I could make the site interactive and let my visitors share their knowledge and experience too, making the site all the more interesting. Thus this site was born in 2009. My favorite hobbies are gardening, woodworking, and hiking. I plan to combine the gardening and woodworking hobbies by offering up plans for various projects that will be helpful to other gardeners. My first three efforts are the constructing raised bed gardens, the grow light stand, and the build a cold frame articles. I've got some patio planters and wooden tomato cage projects in the planning stages. I built my first website in 2007 about campgrounds in the Northwest, Campground-Search.com using my programming skills. That took many months of effort to get off the ground. Unfortunately, after all that work my site was failing to attract visitors or get Google's attention, no matter how useful I thought it was. I read some internet marketing books and soon learned that if the search engines don't know about your site, for all practical purposes it doesn't exist. Somehow I stumbled onto the free Affiliate Masters Course offered by Site Build It! (link below). I'm hosting my tomato growing site on SBI!. The process of site building is simplified to such a degree that success (i.e., profits, not the mere presence of a Web site) is achievable even for a beginner. For an experienced person, achieving success is even smoother. SBI! really does change lives. Yes, there are easier and cheaper ways to build a Web site, such as blog sites like Wordpress, etc. However, online profits require more than just having a collection of Web pages. SBI! includes all the tools and a proven process required to build a long-term, profitable e-business. Too many non-SBI! sites start without profits being "built into" the process from DAY 1. It all begins with the right process. Content Traffic PREsell Monetize is the underlying, logical and powerful process that capitalizes upon the fundamental realities of how people use the Web. C T P M puts you on a solid, profitable business foundation. Between my wife and I we own three websites hosted by SBI! and one website hosted on a no-frills web host. The one on the low-cost host gets the least traffic, because I kind of used guess work in designing the site rather than using SBI! 's methodical approach. Once you create your first site and learn the process, the ideas for creating other sites start percolating. For me it was another of my hobbies that compelled me to start our third SBI!website. My newest site is about home theater sound, Simply-Surround-Sound.com. The income from our sites completely pays all web host costs plus a nice little side income, which continues to grow steadily, month by month. My wife and I can envision that if present trends continue, we'll someday be able to quit our day jobs and work from home. The following is a short testimonial from another real SBI! customer whose life has been changed by Site Build It!